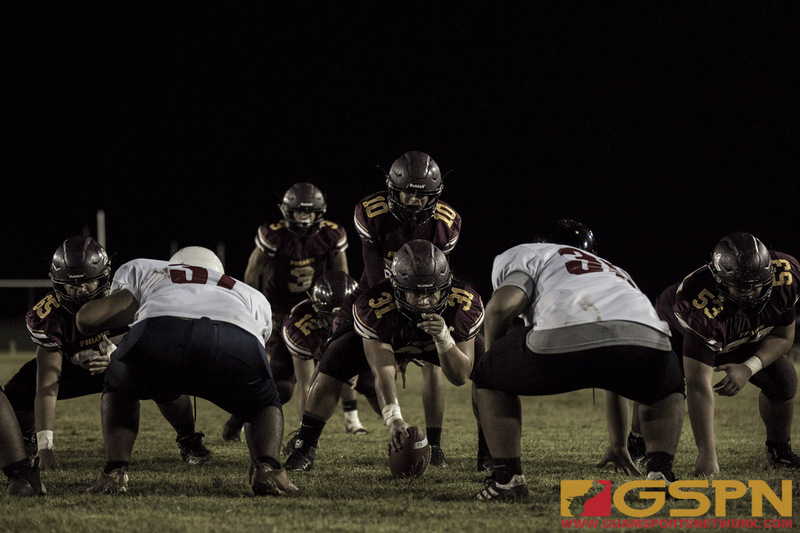 The FD Friars found the end zone eight times en route to a 54-0 win over the Okkodo Bulldogs Saturday night at the GW Field in Week 5 of the IIAAG Football Season. The Friars remain unbeaten (5-0) while turning the Bulldogs away after Okkodo had picked up a win over the Tiyan Titans last weekend. Friar Kein Artero needed only 10 carries to hit 149 yards and three touchdowns with his night ending at halftime. The Friar running game supplied six more touchdowns with Nick Anderson and Justin Leon Guerrero connecting on the only touchdown through the air. The Friars went three-for-three on their opening offensive drives with fullback Izzic Cabrera scoring the games first touchdown on a one-yard run after two chunk yardage runs by Artero. Artero scored two of his touchdowns on their next drives from five yards and one yard to quickly put FD up 21-0. The Bulldogs struggled to get anything going on the offensive end with an interception and fumble leading to Friar scores. Anderson picked up the pace in the 2nd quarter by hitting receiver Justin Leon Guerrero in the corner of the end zone from nine yards out to go up 28-0. Artero added his final touchdown on a six yard burst through the middle to put FD up 35-0. The Friars second punt of the evening ended up not being a punt at all as punter Noah Diaz didn’t receive a clean snap which prompted him to tuck and run, which he turned into a 40-yard gain to set up Friar Edwin Rengiil for a two-yard touchdown to give FD a 42-0 halftime lead. Friar Christian Taitano got in the end zone for the first time this season on a goal line run and return man Brian Anderson capped off the night with a 60-yard punt return for the final touchdown on the evening.